This is a story about a story. A story that might be worth millions of dollars. It’s also a cautionary tale for academics who dream of writing best-selling books. One day in early 1999, I found myself awaiting the retrieval of books in the main reading room of the Jefferson Building at the Library of Congress. I was completing the research for my doctorate in history at Georgetown University. Passing the time by strolling through the alcoves circling the giant room, my eye caught the spines of a group of slim volumes resting on a shelf. They were a series of oral histories compiled by the LA84 Foundation, an organization assembled by the 1984 Los Angeles Olympic Committee that was tasked with, among other things, providing scholars and students with historical materials related to the Olympic Games. One volume contained an interview with Gordon Adam , a member of the University of Washington’s gold medal-winning crew team in Berlin in 1936. Having been a collegiate oarsman, I started reading Adam’s story. It was riveting. Adam grew up poor on a farm in the Pacific Northwest. He worked at a salmon-canning factory in Alaska to make enough money for college and then enrolled at the University of Washington in the depths of the Depression. He decided to try rowing -- at the time a major intercollegiate sport -- and in his oral interview, he told a marvelous tale of how he and his teammates topped Eastern Ivy League competition for the right to represent the United States in Berlin. He recalled traveling to Europe, his impressions of Nazi Germany and seeing Hitler at the opening ceremony. He finished by describing his crew’s stirring come-from-behind victory over Italian and German crews in a very tight race. Although that oral history had nothing to do with my dissertation or research, I knew I’d stumbled upon a great story. Global in scope, cinematic in its drama, this story -- I felt strongly -- would sell. I copied the oral history on the library Xerox machine, tucked it away in a file, and told myself someday I would research and compose a book on it. Life moved on. I finished the dissertation, accepted a visiting assistant professor position and gained a tenure-track job. I focused on securing tenure by publishing my scholarship on radio and journalism history in top journals. I also worked on improving my teaching and agreed to enough service commitments to fill up my time. All the while, however, I kept gathering material on that 1936 crew team. I “collected string,” as they say in journalism. The University of Washington put me in touch with surviving members of the crew, some of whom I interviewed, and I discovered the original CBS recording of the race broadcast at the Paley Center for the Media. I contacted Dan Raley, one of the last sports editors of the Seattle Post-Intelligencer, for more information on the crew, and he generously shared his materials and thoughts. Then I received tenure, and I started to seriously pursue the book. I wrote a book proposal, a sample chapter, a magazine-length version of the story and even a 750-word op-ed about this incredible Olympic moment. I never considered composing the story as a dry academic or scholarly tome. Nor did I have literary pretension. Rather, I wanted to bring the story alive and engage the public journalistically, reporting the facts interspersed with the words and voices of the Olympians themselves. The story, it appeared to me, required little embellishment. Crickets. I pitched the material everywhere. I actually had started pitching it as a book proposal and magazine article even before I got tenure, using the news peg of the 2006 and 2008 Olympic Games. I tailored my approaches to every kind of outlet as precisely as possible. For example, I pitched the story to the Chronicle Review, emphasizing how impoverished Depression-era college kids used intercollegiate athletics to learn about the world. But my magazine article pitches were either rejected or ignored by Slate, The Atlantic, The New Republic, Sports Illustrated, Smithsonian, the New York Times Magazine and elsewhere. In fact, my version of the story was continually and consistently turned down as an extended essay, a newspaper column and a book proposal by numerous editors, literary agents and publishers. I got almost no feedback. I stopped counting rejections when they passed 60. Still, I refused to give up. In 2012, with the London Olympics on the horizon, I again pitched the story everywhere. Josh Levin, an editor at Slate, liked it. He published it as “Six Minutes in Berlin ” and made it the centerpiece of their 2012 London Olympic coverage. The article exploded on the web, lasting four days as Slate’s most-read feature, generating a long comment thread and thousands of social media recommendations. Emails flooded in. Literary agents that had previously rejected the book proposal now inquired whether I would be interested in representation. One major publisher that explicitly prohibits the submission of unsolicited manuscripts wrote and asked me to send the book manuscript. Then, just as quickly, silence. It turned out that, one year before, Viking Press had inked an enormous deal with an author named Daniel James Brown to write the story of the 1936 crew. That book, titled The Boys in the Boat, came out in 2013 and remains near the top of the New York Times nonfiction paperback best-seller list as of this writing. Brown’s book tells the story of Joe Rantz, one of the rowers, and the significant investment by Brown’s publisher in the success of The Boys in the Boat made others reluctant to take on a competing project. An important New York literary agent told me as much over the telephone. The publishing industry, he explained, was under enormous economic stress. The book trade was getting slaughtered, he said, and big publishing had essentially evolved into a cartel (my word, not his). Publishers simply could not compete with each other by bidding competitively for the same stories, and once Brown got his contract, any chance I had of publishing “Six Minutes in Berlin” as a book had evaporated. No major publisher would waste their time or resources undercutting another major publisher’s list. That was bad enough. But then The Boys in the Boat came out, and much to my surprise, my interviews with two oarsmen were cited by Brown. I only shared transcripts with the oarsmen themselves -- coxswain Bob Moch and Jim McMillin -- both of whom had died in 2005, before Brown met Joe Rantz or began his research. Somehow copies -- the only ones I shared -- ended up in Brown’s hands. He and his publishers undoubtedly knew I was working on my own book because of the publication of “Six Minutes in Berlin” in Slate in 2012. The interviews proved remarkably illustrative of occurrences in the boat during both the national championship and the Olympic gold medal races, and it disturbed me greatly to see information I had collected published elsewhere without my permission. The Boys in the Boat is a good book, but it’s not history. It’s not the book I would have written. It’s peppered with inaccuracies and embellishments. One of the reasons my manuscript took so long to compose was that I possess a doctorate in history, and verifying information by cross-referencing sources requires an enormous amount of time. In other words: accuracy matters. I’m not bothered by the slight copy-editing errors that pop up in The Boys in the Boat that are endemic to any manuscript -- such as when Cornell University, not Columbia University, is inaccurately credited with victory in the first Intercollegiate Rowing Association regatta. But I am disturbed that inaccuracy and embellishment is apparently acceptable when writing history for popular audiences. For example, Brown offers this dramatic opening to the race broadcast: “At 9:15 a.m., the voice of NBC’s commentator, Bill Slater, began to crackle over KOMO’s airwaves in Seattle, relayed from Berlin.” But according to NBC’s records in the Library of Congress and numerous other sources, Bill Slater was in London that evening preparing to cover the next day’s White City track meet featuring Jesse Owens. The rowing final in Berlin actually started at 9:02 a.m. Seattle time, and anybody tuning in to NBC would have missed it because the network widely publicized the wrong starting time in newspapers around America. Only those people tuning to CBS would have caught this Olympic exclusive. Yet these facts don’t deter Brown. “NBC’s Bill Slater was screaming over KOMO’s airwaves in Seattle,” he informs his audience at a particularly dramatic moment in the race narrative. This did not occur. A lot of ink has been spilled recently about the need for academics to write for wider audiences. Much of the criticism presumes that academics prefer to write and speak in impenetrable rhetoric designed to limit communication to only people initiated in the cloistered world of scholarly interchange. I don’t doubt that this problem exists. But many critics have no idea how many scholars -- like myself -- have attempted to write for wider audiences but found ourselves blocked by gatekeepers in the publishing industry. Although I’ve published numerous essays and newspaper columns for wide public readership, and I believe my book proposal proved my ability to deliver clear, serviceable -- and even engaging -- prose, no publisher took a gamble on this first-time author coming out of academe. This story, however, might have a happy ending. Although Daniel James Brown has a best seller and the revenues from his movie deal for The Boys in the Boat, I continued pursuing my project. I reshaped my manuscript to more closely align with academic standards and fit the constraints of scholarly publication. I then sent it out to academic publishers. Obviously, Brown’s best seller significantly damaged the trade market for “Six Minutes in Berlin.” But the University of Illinois Press responded positively to the parts of my manuscript about Olympic broadcasting. No single volume exists on the birth of global sports broadcasting as developed by Nazi radio authorities. If I were willing to interweave this larger story about global telecommunication history into the narrative of the rowers, who gained brief national celebrity from their victory, they told me they would be interested. But I needed to satisfy peer reviewers and severely limit the word count. The first peer reviews proved encouraging, and a contract was signed. Six Minutes in Berlin: Broadcast Spectacle and Rowing Gold at the Nazi Olympics  will be published this month. But I won’t make a million dollars. EDITOR’S NOTE: Inside Higher Ed reached out to the publisher and author of The Boys in the Boat for a response to this piece, and they had no comment. Michael J. Socolow is an associate professor of communication and journalism at the University of Maine. 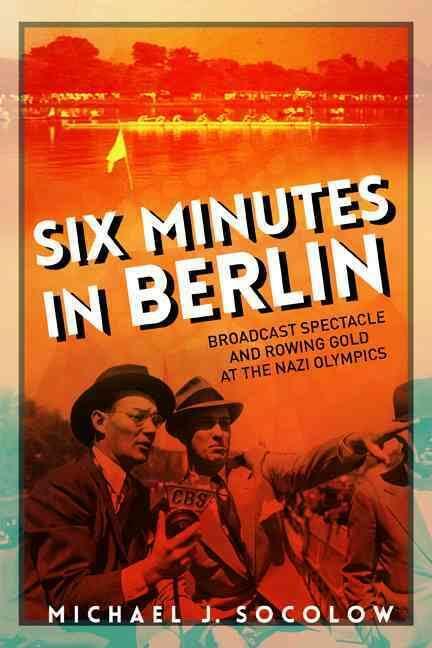 Six Minutes in Berlin: Broadcast Spectacle and Rowing Gold at the Nazi Olympics will be published this month by University of Illinois Press. Rowing teams race to the finish line at the 1936 Berlin Olympics.